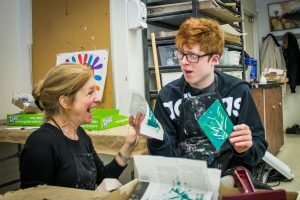 These special Accessible Studio Family art workshops for children and youth living with special needs encourage collaborative artmaking that involves the entire family. Based on exploring the McMichael’s collection and spectacular grounds, each session focuses on an art projects planned for various skills and abilities. This program is free with gallery parking fee. Registration is required. Please register below. Note: This workshop is now full! The McMichael would like to thank everyone for their support! Parents and/or caregivers must accompany the child for the duration of the program. Workshop description: Holidays are about spending time with the ones we love and wishing them good fortune and happiness. Decorate your own Family Wish Tree and share the spirit of the season with those who matter in your life. Based on exploring the McMichael’s collection and spectacular grounds, each session focuses on an art project planned for various skills and abilities.